John 20:19-21, “Then the same day at evening, being the first day of the week, when the doors were shut where the disciples were assembled for fear of the Jews, came Jesus and stood in the midst, and saith unto them, Peace be unto you. And when he had so said, he showed unto them his hands and his side. Then were the disciples glad, when they saw the Lord.” 24-29, “But Thomas, one of the twelve, called Didymus, was not with them when Jesus came. And after eight days again his disciples were within, and Thomas with them: then came Jesus, the doors being shut, and stood in the midst, and said, Peace be unto you. Then saith he to Thomas, Reach hither thy finger, and behold my hands; and reach hither thy hand, and thrust it into my side: and be not faithless, but believing. 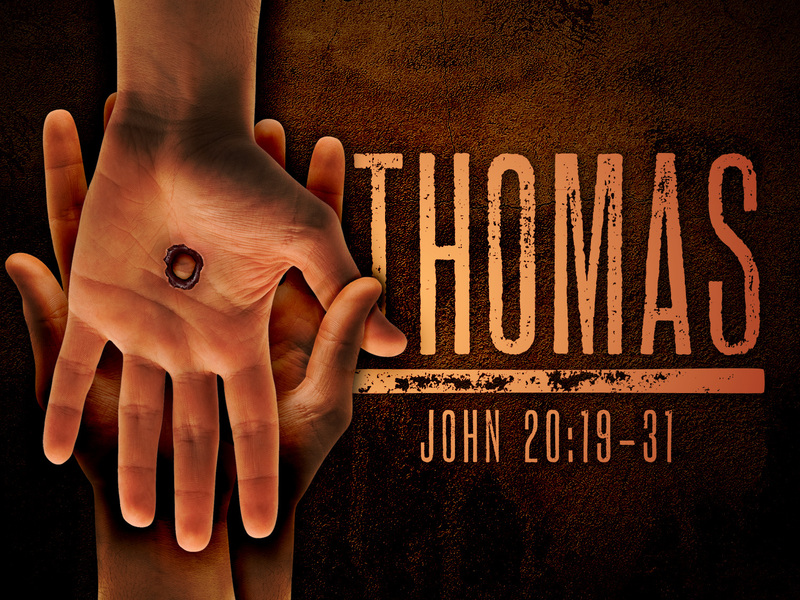 Poor Thomas, he forever has held the title “Doubting Thomas”, but is that really fair? If I would put myself in the same position, I would no doubt have the same reaction. Just think the disciples had all been aware what just happened to their friend Jesus, He was arrested, tried, beaten, hung on a cross, died, and put into a tomb with a large stone rolled in front of it. I am not naive to think that I would not of had the same reaction when told by the other disciples that they had seem Him alive as just as I would not of eaten of the fruit of the tree of knowledge just as Adam had. Instead of “Doubting Thomas” it could just easily have been recorded as “Doubting Jeff” or you could put your own name in the parentheses. There is an old idiom “Seeing is believing” and although we rely on what we see to make many of our decisions our eyes can deceive us. Neuroscience has shown that the cells of the primary visual cortex create small distortions in which our brain tries to interpret as best as it can. So in reality what we believe we are seeing is just an interpretation. Have you ever looked into the sky on a partly cloudy day and see some shape in a cloud and have a friend see something entirely different? Jesus told Thomas that “Blessed” are those who believe without seeing, we often call this “Faith” Romans 10:17, So then faith cometh by hearing, and hearing by the word of God.” So we as believers in the resurrection of our Lord Jesus Christ believe it by faith, right? True but we do have evidence that supports our faith in the resurrection of Jesus Christ, and one is indeed the word of God which has the recorded birth, life, death, and resurrection of our Lord. The Apostle Paul in Corinthians 15:1-8 tells us of how the disciples were witness of the resurrects Christ, he goes on to tell of 500 who saw Jesus at one time, and then tells of his own vision of the risen Lord on his journey to Damascus. We all also have evidence of how His disciples were transformed from men cowardice in the upper room to men who would soon declare this message which great boldness even to the point of being martyred for His sake. I couldn’t imagine someone would lay down his own life for a made up story of a risen Lord. This didn’t stop with the death of those that had witnessed the resurrected Jesus Christ. But even today we who have not seen the physical evidence but have been filled by His precious Holy Spirit still declare that Jesus Christ is alive and will very soon return.